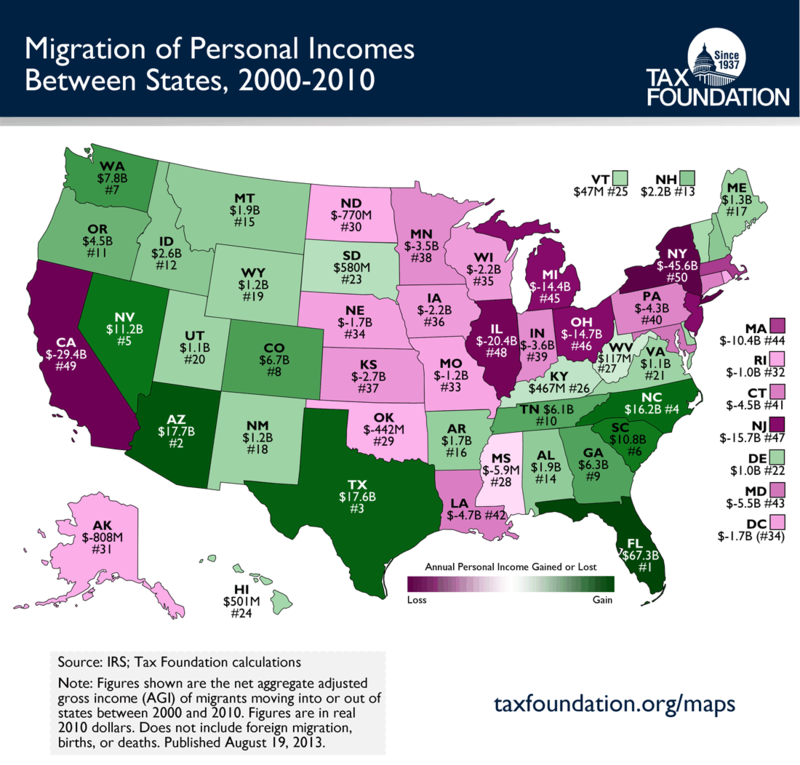 The Tax Foundation --a non-partisan, non-profit research organization that has monitored tax policy at the federal, state and local levels since 1937-- released a map this week showing the migration of personal incomes between 2000 and 2010. According to Richard Borean of the Tax Foundation, "Florida benefited the most—interstate migrants brought a net $67.3 billion dollars in annual income into the state between 2000 and 2010. The next two highest gainers were Arizona ($17.7 billion) and Texas ($17.6 billion). New York, on the other hand, lost the most income ($-45.6 billion), and is followed by California ($-29.4 billion) and Illinois ($-20.4 billion)." Georgia came in at 9th position with $6.3 billion in new annual incomes from migrants. Property values in the South are lower. Taxes are lower. The air is cleaner. People are more friendly here. It's quite understandable why large numbers of people would leave the north for the little ol' south. The next time a Yankee starts cracking wise or making derogatory remarks about how bad things are in Dixie, show them the map from the Tax Foundation.